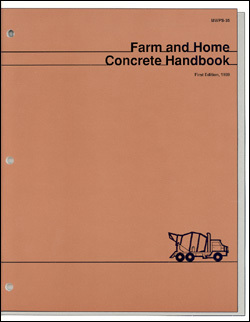 Farm and Home Concrete Handbook describes and shows all major aspects of building with concrete in a rural environment. This handbook describes fundamentals of estimating, ordering, site preparation, forming, placing, reinforcing, finishing, curing, weather precautions. Designs and construction instructions for walls, silos, and other structures are provided. Appendixes offer more information, instructions, and designs.